Today’s Vasantham Channel aired Boothnath Returns, a hindi bollywood movie of which I enjoyed. India is riddled with corrupt officials, poverty and ghosts as portrayed in the movie. There is truth though as we hear of women being raped if they stay out late. Police officers do not do their jobs nor do the health officers to keep the slum areas clean and safe. Boothnath is a ghost sent back to earth to scare any kid. In heaven, he was ridiculed by other ghosts awaiting their turn for reincarnation. On earth, he befriends a young lad under 10 years old who can see him. Boothnath helps the boy to evict ghosts haunting buildings by going after corrupt officials that caused their deaths. Boothnath then meets a corrupt politician called Bhau and decides to campaign for elections to help the people get basic necessities like drinking water, living areas cleared of rubbish and poverty. I find this heartfelt as it depicts the truth of elections. No voter ID card, no voice. A ghost runs for elections as the Indian Constitution does not bar a ghost from running as a candidate for elections but the check point is the person must vote in person. As corruption goes, the officer who did not get a bribe to issue the death certificate of Boothnath. Hence Boothnath is deemed “alive”. I will not state the ending as you have got to watch this feel good movie. Fall or Autumn is when my next choice of fruits appear. Plums…gorgeous blood red or deep dark maroon juicy plums would appear in supermarkets. As if to taunt me, we now have pulots…green, yellow green or even reddish ones. Plums are imported from Australia, New Zealand, USA, South Africa, Chile and Italy. Some taste “sandy”, others are crisp and sourish. I love the crispy sourish ones as it really perks me up. China has furry longevity peaches. Pretty to look at on display at birthdays for seniors, peaches signify longevity and well wishes or the elderly. I remember paying $1 to a street peddlar on the streets in Zhuhai, China and took back 4 big juicy looking peaches to my hotel. I love USA peaches and nectarines. Come fall season, it is time to load up on juicy soft nice tasty peaches or nectarines. Strangely enough, I remember reading somewhere that any fruit that is round is bad for dieters as it is filled with sugars. So, I tend to pick sour ones. Lesser sugars but hey it satiates my love for peaches, nectarines, plums or pulots. My brother has the best job in the world! He eats for a living! He is an epicurean of sorts, doing food tasting and helping chefs do the best food pairings with food, fine wines and coffees. He sent me the above photo last night. He was tasting this in Hong Kong. 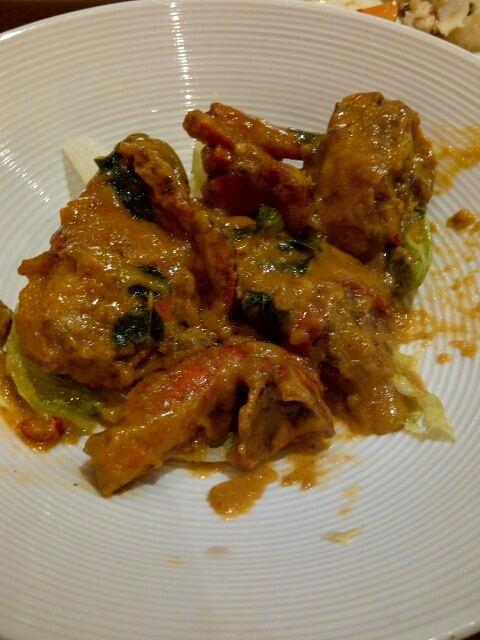 I was amused at how the fine dining hotel he supped at treated the “crab” making it less cumbersome to eat. 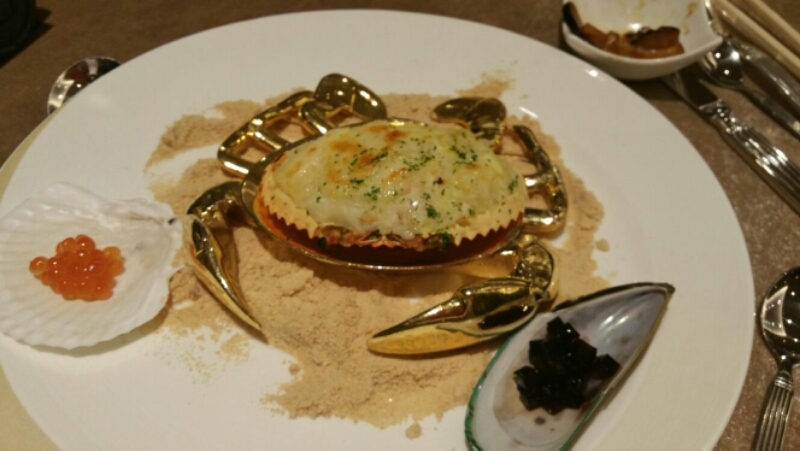 Deshelled crab meat cooked and placed onto a crab shaped plate! Hong Kongers are remarkable at turning a messy dish way of eating the crab with hands into one of eating with fork, knife and spoon. Over here in my little red dot…chilli crabs, black pepper crabs or salted egg yolk crabs are best eaten with 4 paws and a bib!! 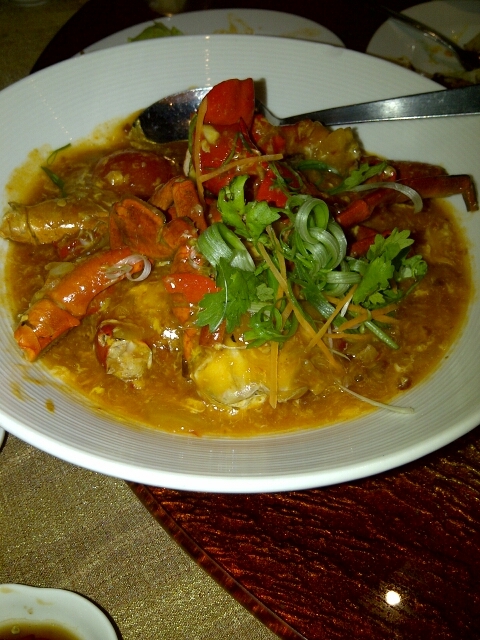 If you are in my little red dot, you cannot leave without devouring our infamous chilli crabs! 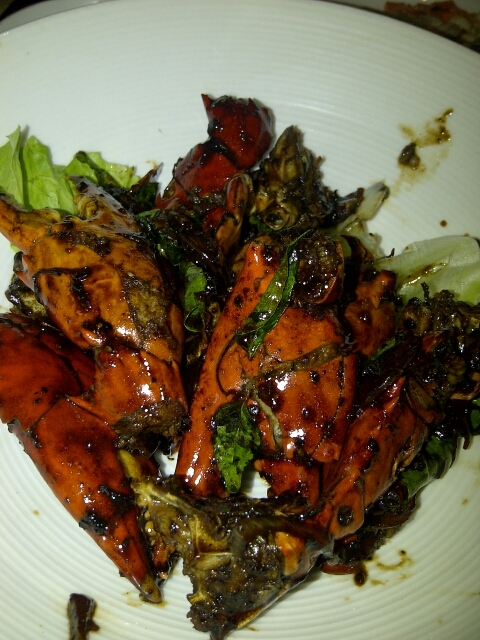 Below are photos of 3 ways, crabs are prepared as dishes in restaurants here. Booby Prizes Are No Fun, Or Are They? It has been a while since I have been amused with the notion of booby prizes. This all stems from my favorite DJ duo, Glenn Ong and Flying Dutchman on One FM in my little red dot. I had earlier posted on their Halloween Trick or Treat game on air. The booby prizes are truly imaginative! There is the assortment of a bag of dead leaves, all the shredded paper within the radio station, used pair of boxer shorts and a medley of items that one usually finds in “poo” bag for pets! All in the name of good fun I guess ha ha! But I certainly would not like that. Ugh! One caller was at the hawker center having breakfast and to be delivered all these tricks would seem “ugh”! I remember when I used to organize charity golf tournaments for some 188 golfers and put in booby prizes, calling them “lychees” – this is a specially concocted drink of a tall glass of Tiger Beer and putting into this glass of beer, two golf balls. The “winner” is usually the worst or last 2 players of the golf tournament and they will be awarded this prize. They will go on stage and in good golfing spirit gulp this down and keep the 2 golf balls to practice more. I enjoy organizing golf tournaments. I do not play golf but know enough about golf without literally except put sticks to the small itty bitty ball! LOL! I learnt about hole in one, nearest to the pin, eagle, bogey, albatross! Food That Is Bad For Health Tastes Good! I find all the foods that are labelled “bad” for health taste terribly grrrrreat! Potato chips or crisps….delectable till the last chip in the bag with one howling for more. Who stops at just sampling 2 chips? Usually it is the whole bag full and it is always down the hatch in front of the goggle box! French fries….greasy and salty! Who does not indulge in a pack of these if standing in front of a counter to order McDonalds, Burger King, Wendy’s, Kentucky or Hungry Jack’s! We all know chocolates are full of sugars. What about that fizzy cola? Coca Cola, Pepsi, Mountain Dew, Sgt Pepper’s etc all have sugars. Even if it is “sugar free” it causes blood sugar to elevate. Doughnuts and all pastries including cakes are to die for! Who would not swoon over a great German Chocolate cake! Once for my birthday, someone bought me a 7 layer chocolate cake from the grand dame of hotels…the infamous Raffles Hotel. It cost a bomb I was told. Close to a $100 for a small cake to be shared by 5 people. But ohhhhh….it tastes so good that I licked every morsel off the cake board! So….it is a fact . ….if you find anything great tasting, trust me…it will be probably bad for health. It is a challenge and needs strict discipline….afterall who can stop at 2 pieces of chips? I racked my brains and gave up as these days there are too many numbers in my head that I choose not to remember mobile numbers and rely on phone contacts to show me who messages me. So, politely I thanked the person and gingerly asked who the person was! Hmm…this was my second ex boss from two different companies to text me in a week. I never felt appreciated. So this was a nice eureka moment! So it seems that those idiots finally achieved nirvana to realise I was not bad afterall. A tad too late! Still I felt honored as their attempt to tell me must be lauded. Over the years, I have received 4 apologies for their appalling behaviours. One thought he was dying as he had to undergo surgery and called to seek my apology in case he died and felt he did not seek my forgiveness he would not assuage his conscience. How odd!! I only stopped short of accepting one twit’s apology. This Dutchman was pure evil and conniving at office politics. I could not forgive him as I felt he needed to learn the mistake he did and deserved to feel remorse for a while more before I reply to his email. I just feel that people should not be conniving, evil, liars or just out to hurt others…live and let live. If one gives you help, remember to give back and not turn around to bite the hand that helps. If I choose to help, I help with heart and soul. I do not expect returns but I do not need repercussions either. Halloween is largely celebrated in USA. But it seems my little red dot is also having a swing at Halloween, which is this weekend. I guess it is largely to do with the expatriate community we have as residents and or mixed marriages, including local humans like me who went overseas for an education. In USA, I remember fondly the times I enjoyed scooping out the pumpkin and lighting up the lantern with my host parents. Of course there was also the naughty part whereby as students I joined the friends I had who were living in the dormitory to throw toilet rolls on trees such that they hang to the ground, as it unrolls! It was pure fun in USA. HA! But one must never do that in Singapore. We have a FINE policy. Littering or destroying our NParks trees. We are a clean and green city and this is not allowed. But I guess if it was a private tree in the garden of a home owner, it is fine but the owner will have a hard time removing the toilet paper from the trees especially if the rains fall! UGH! Imagine the mess!! So, the commercialization of Halloween is in and as I listened to my favorite DJ duo on One FM 91, Glenn Ong was sharing that this Friday, they have the Halloween Wheel to spin to the lucky callers. If the wheel landed on a trick, then they get a bag of dried or dead leaves from the garden of one of the DJs whilst if it landed on a treat, the lucky caller gets a free snowboarding or ski package in an indoor climatic control place which was worth close to $180. It brought back memories of times with my host parents. It also reminded me that Thanksgiving was also around this time and the aroma of the pumpkin pie that my Host Mum Lucile used to bake for me wafted into my memory cells. As a community in Little Red Dot, we are not insulated from the dynamics of the world and the world is made even closer or nearer with smart phone apps and devices that allows us to connect with the world on the other side real time. As Halloween is celebrated in Singapore, I am sure as our people traverse the world to work, study or play, we also bring with us our 4 major ethnic holidays which include Diwali, Hari Raya Haji, Hari Raya Puasa, Chinese New Year and Vesak Days. I remember also sharing our festivities with my American friends and international students like me of our festivities. Half the fun is sharing and it is a feel good moment for me. Meanwhile, let’s hope the haze dwindles as this weekend is the Subaru Hand Challenge. This is where contestants who called in and qualified for a spot to place their palm on the Subaru car and if they are the last one standing, they will walk away with the car. Not easy! Under the hot scorching sun, rain and only 5 minute breaks after many hours and dinner break of 10 minutes, it is sheer gruelling work to win the car. Many have travelled from the region to try their “hand” on this and so far, all cars have been won by local Singaporeans. Good luck to the contestants this weekend. May the haze dwindle and they do not have an added burden on their goal to win the car! Chocolates have come a long way from humble beginnings of plain milk, hazelnut, fruits and raisins or hazelnut varieties. These days, I see macadamia nut chockies, cranberry, butterscotch, peanut butter, peanut brittle, mints, turkish delights, just about any flavor, comprising peanuts, mints, Drambuie, Rum, Whisky etc. Also we have up to 72% cocoa ie the dark kind with all the good phenols they claim in good heart health. I once tried up to 83% cocoa and liked the taste. Plain milk bars are boring and recently I had to try the new rage…salted caramels in chockies. Not just plain salt but sea salt to boot!! Yes…as we get more sophisticated, so does my humble taste buds for a simple chockie bar. Yummy chockies….I envy those who live in Australia or NZ….or Switzerland….or Europe…Suchardt, Lindt, Cote ‘Zor, Cadbury, Nestle, Toblerone, Whitaker, Ghiradelli, Reese’s, Hershey, Van Houten and so on…..
For some strange reason, I dote on one particular Garfield. I refer to my more than 457 soft toys of Garfield, in many poses and in different outfits. But, I choose to cuddle, snuggle and travel with this 22 year old stuffed toy that is fast losing weight as it is hugged to bits. Paws are worn but I still love this inamimate fur ball. This is my one and only cat! I don’t usually wear hats. Not even beach hats no matter how scorching hot the sun is. I would use SPF +50 and enjoy the tan. This was pre illness. I used to enjoy the long swims during noon time and would sport a dark tan. About my hat….I took a 3 day trip to Bangkok once with couple of other business associates to barter a deal. The hospitality of Thais are immaculate! With their Sawadeekap greetings and driving us to visit the Bridge Over River Kwai…the lovely business lady who was hosting me took off her large brimmed straw hat and gave it to me when I admired it. I was being polite as I liked the quaint antiquated fisherman straw hat that sat on the head of a refined and sophisticatedly dressed woman. I took it home and it now adorns the head of my giant Garfield. More importantly, I remembered the kindness of this business woman who have up her shade to prevent freckles and sun spots as we walked through temple ruins and after that on the Bridge Over River Kwai. As for the mat, aaah the Garfield Mat that was handmade of wool by a former staff I first met at my first job. I found out recently she passed away from a massive stroke in her early 40s, leaving behind 2 small children. I look at the worn mat and I remember her as she spent nights knitting me a shawl and a scarf before I left for studies in USA. Memories remain as the things they gave me, reminds me of them and I am grateful for knowing them. If I Could Live My Life Over…. If I could live my life over, I want to be an internal medicine specialist. A mad scientist if you will! I would be as caustic as House M.D. but a darn good diagnostician. I could help those who need medical puzzles resolved. If I could live my life over, I could marry my Ex boyfriend and frit away his $15 million dollars whilst tolerating his way of treating others. With my medical degree, I could heal the poor using his money 😉 and buy all the Prada and Gucci apparel I like and feed the poor. If I could live my life over, I would not want to be an employee. I would be an employer and NOT do what my bosses did to me. If I could live my life over, I would still want to be a crazy collector of my inanimate furballs called Garfield. Life is not a bed of roses…huge thorns…plus roses die pretty quickly after blooming. Life has its trials and tribulations. On and all, life is what we make out of it. Or at worst, others make it harder. Have a good life all….or at least try to….